Sherlock Holmes has returned for another film! This is certainly one of the better ones in the series and shows that the franchise has still got a lot of energy in it. The stakes are more personal than ever as Holmes is directly responsible for the villains getting the lead for once. He will have to ask for the assistance of his longtime comrade Watson once more. Time is of the essence, but if anyone can save the world, it’s Holmes! The film starts off with a villain attempting to get a legendary pearl through the cops by giving it to an innocent old man. Fortunately, that old man was Holmes in yet another one of his disguises. He takes the pearl to the cop, but isn’t too pleased with how they have secured it. He demonstrates how easy the alarm system is to deactivate, but in the meantime the villain makes sure to nab the unprotected pearl. Holmes is to blame for the security features no working as intended, but this is no time to feel sorry for himself. Holmes has to quickly figure out where the pearl is now before it is too late! Holmes gives the main villain (Conover) a lot of hype throughout, but I certainly wouldn’t say that he is on the same level as Moriarty or the female villain who bested him a few titles ago. Still, he does seem to be pretty intelligent so the guy isn’t your average crook either. Underestimate him at your own peril. Conover doesn’t seem like the kind of guy to get his hands dirty so usually he relies on underlings to do it for him. He does have some swet moves though like when he qwuickly disarmed Holmes at the end. He adapts very quickly and probably just needs to work on his reaction times a little bit. His right hand man the Creeper gets a much bigger role, but isn’t quite as interesting> The Creeper likes the main heroine, but that’s his only real character. It seems like the guy can’t really speak anymore so the super strength came at a very heavy price. Holmes himself is very solid as always. He probably should have found a way to secure the pearl before doing his experiment, but at that point it would have spoiled his chance to make the point that he was trying to present under the guise of spilling a bunch of fruit. He also figured that the guards would at least be watching the jar a little right? Holmes makes sure to make a comeback from there though and the only thing left for him to fear was his own bad habit of gloating at the end. It seems like this has happened several times throughout the film series where Holmes will get the villain at gun point, but starts to gloat for so long that the villain just yanks the gun away. Holmes really needs to watch that as it could be the end of him. Watson is also a loyal sidekick as always. 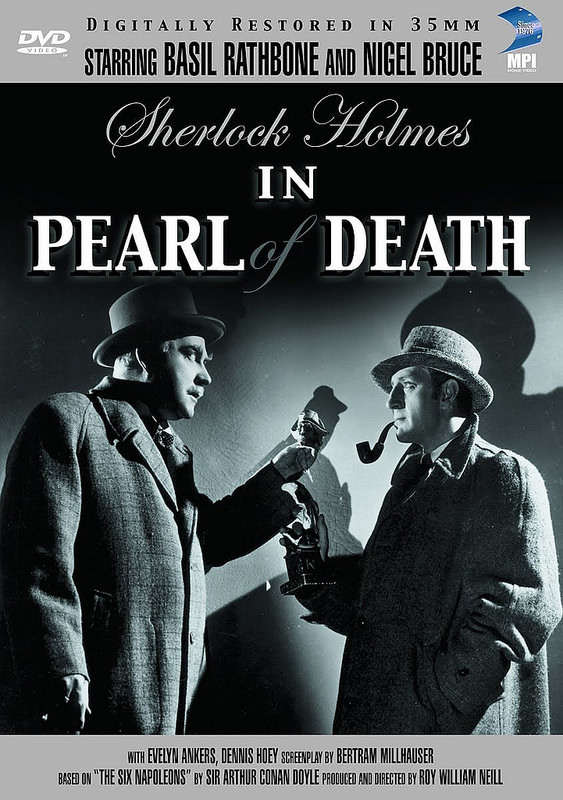 He does come close to ending Holmes’ life by mistake though when he delivers a book from the main villain. Holmes very nearly fell for it, but luckily Watson was able to drop enough clues to help him skate by. He may not be the smartest chap, but Watson always tries to protect Holmes from the outside elements like the newspapers and all. He’s just a nice guy so it’s a shame that things don’t tend to swing his way. Meanwhile Lestrade probably has his worst appearance in a while. Of course, I understand that he doesn’t really care much for Sherlock Holmes at times since he has nothing but contempt for theories. Still, Holmes has a great reputation and he has solved many cases before. Shouldn’t the cop at least believe him a little? Lestrade is so determined to be right that even when multiple people are murdered with the same method he believes that it is a coincidence. I don’t know how he can say that with a straight face. Honestly Holmes has to put up with a lot in this town. The cops even hold things from him to save face which ultimately just makes his job a lot more difficult. It’s definitely one of his toughest cases as well. The body count feels a lot higher than usual as it takes Holmes a very long time to track down the killer at large. By the time he does only one of the people on the hit list is still alive. Better late than never I suppose right? The pacing for the film is really good and you will definitely feel the intensity all the way through. This definitely isn’t the kind of case that is all fun and games. Lives hang in the balance. Overall, The Pearl of Death is a really great film. Every character gets something important to do and Holmes gets a lot of credit. He looks like the tactical genius that he should be portrayed as but everyone else does their best to pitch in. While Holmes is very competent, he also is shown to not be infallible which is a big part of what this movie is focused around. Some detectives do seem to be perfect like Detective Conan, but for the most part that is too much to expect out of anyone. If you are looking for a solid murder mystery then look no further. This is the film to look out for and it’s easy to jump into with no prior Holmes knowledge. The opening scene is also handled really well so the movie starts off on a high note. At most, the ending might just have the shortest Holmes speech so far which is a shame. They’re all usually so long and over the top with how cheesy they are that it’s the perfect way to end a film.